I’ll be honest- I hesitated to begin writing this post because at this point the 5k is totally old news. I mean Thanksgiving is over done with. Heck, many of us have already elected to freeze whatever leftovers are still around at this point. The race was November 15th, which might as well be ancient history. However when it occurred to me that this story was not already covered in Sports Illustrated or even the Daily Camera, I decided who cares. A slightly outdated post is better than no post, provided you still believe in my blog. I know I have been a sporadic blogger but life keeps getting in the way. Its not just the regular routine of trying to convince Dan to wear another outfit that is taking up my time, its other things too. I’d blog about them but I just haven’t had time. Now that its taken longer for you to skim this paragraph than it took me to run the race, here are the details…. This was not just any 5k. This was the highly anticipated (by me) Debut Moore versus Sinel Running Challenge, better known as Boulder Running Company’s annual Panicing Poultry 5k, surrounding which were rumors of amazing giveaways including Smartwool products. Nothing was keeping me away from the possibility of free Smartwool, not even the fact that I had not run but one four miler per week over the past four weeks. That was a minor detail. The other minor detail, which was actually a major big detail was that about three weeks prior to said Smartwool giveaway, I mean race, was that Dan ran a mile on the treadmill. This may not seem like a big deal but it was. Consider the facts: Dan ran in high school. He ran in college, albeit for a Division III school but still really fast. I want to say his PR was sub 17 minutes or thereabouts. He stopped running circa 2000, period. As in never ran again at all neither for training nor for fun nor even to get anywhere really fast. Like not at all. We’re talking about a guy who exercised his condo’s workout room in hiking boots, not for the added ankle support but because his only other athletic shoes were of the Shimano cycling shoe or the three pin Nordic ski boot varieties. He didn’t own running shoes until very recently. So the fact that he ran in said shoes for a mile represented like a million percent increase in his mileage over the past nine or so years. Although I am not really one to impose my opinion or try and convince someone to do anything they might not otherwise do I uncharacteristically made it my mission to do everything in my power to convince Dan to do this race with me. I begged. I pleaded. I dared him. I wasn’t sure if it was working so I feigned indifference. Let him do whatever he wanted while I was out collecting free Smartwool, what did I care. Who cared if he could probably do a sub 20 minute 5k, we’d never know anyway. Wanting to cover all my bases, I also made sure he knew that I was going to be really mad if he encroached on my territory as running was “my” sport and there was only room for one of us in this exclusive sport and I already had dibs. It was worth all of the reverse psychology when Dan finally went to active.com and registered. The only thing left to do was to continue to not train at all and speculate on the contenders. I wasn’t sure how the race would play out, given our stats. Pam: two time ironman finisher, 5 time marathon finisher, PR 3:55, best 5k 22:17, best 10k 47:31 (but not since 2006). Recent accomplishment: Finally able to breathe without feeling like total asthmatic with exertion at altitude. Dan: Competive runner in high school and college, best 5k sub 17ish, other notable achievements include having legs two times as long as mine and having established himself as that guy who never trains but never gets dropped on fast group rides despite claiming “It was hard.” You know what’s hard? Thinking you’re really fit and then getting dropped like a bad habit on the climb to Jamestown. Or being in ironman shape when your boyfriend smokes you on the climb to Ward despite having learned to use clipless pedals about 5 minutes previously. Anyway, just sayin. 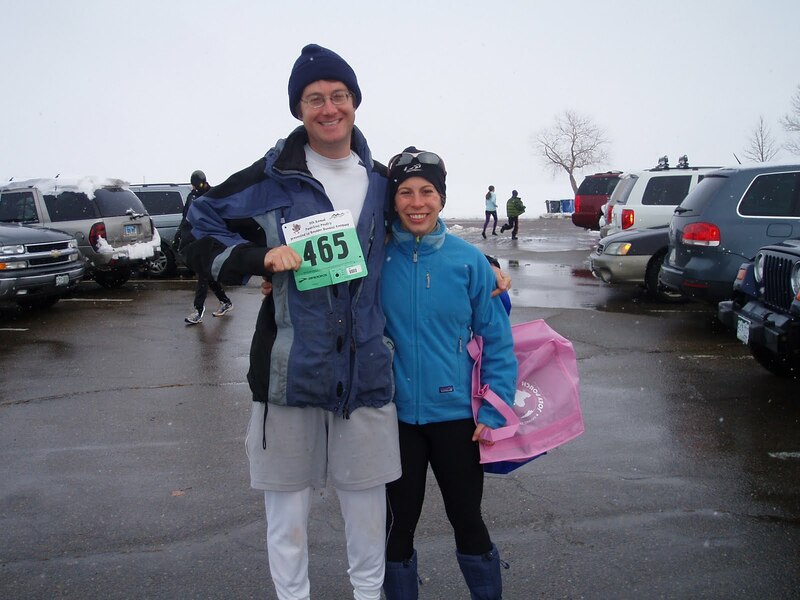 My secret weapon was that although I hadn’t been running per se, I had been swimming almost daily and this cardiovascular consistency had to count for something. I was up against King of Sporadic Exercise himself so I hoped my basic fitness would afford me some advantage, despite the fact that this had never been true before. Race morning brought freezing temperatures and lots and lots of snow. Not even inclement weather could stand in the way of the Moore/Sinel Challenge however. We did our warm up together which despite the fact that in just a few minutes Dan would be my mortal enemy, was a lot of fun. This was our first time running together. After the warm up, it was all business. The gun went off and I was on Dan’s shoulder for about 50 yards. Then I felt like it would be wise to run my own race because I couldn’t really breathe. Then about 15 yards later I decided I might as well give it a real try so I caught up to him. Within about a quarter mile I was annoying myself with my steam train-like breathing, confident that I would DNF if I continued at this pace so I slowed a bit but kept Dan in my sights. He was not far ahead of me at the turnaround but I had resigned myself to not being able to catch him. I tried to maintain my pace for the second half but was not able to. As I neared the finish line, Dan approached and acted as my carrot as I sprinted for the final 25 yards. (Thanks, babe!!) I came through the finish, breathless, with my heart rate monitor reading 49 bpm (wtf!?) with a time of 24:52, an 8:00 pace. This was good for 6th in my age group and 13th woman. Dan was only a few seconds ahead of me, with a finish time of 23:02, a 7:25 pace. Not bad for a guy who trained a total of 5 miles. Not 5 miles a day. 5 miles period over the course of a few weeks following nearly a decade off. The good part is our kid could be fast. Not that I would ever pressure this faceless as yet nonexistent person, I’m just putting it out there. The other good part was there was a beer garden and bratwursts after. Although there was no free Smartwool in the end, there was a kids race around the parking lot which was, in a word, priceless. You can get Smartwool at REI but you can’t put a price on the sight of a bunch of little ones clad in snow suits running for their lives from a few adults dressed up as turkeys. Totally impressed by both of you. And glad Dan only finished “a few seconds” in front of you. 🙂 Sounds like soo much fun!